Estimating how much paint – actually a suspension of pigment and binder in water – will be put onto paper by a watercolour brush is not an easy task. The few people who seem to have attempted this before have charged the brush with wash, then painted that out onto paper and measured the area covered. There are several problems with that. Even the most experienced painter will not always get the paper completely evenly covered, and ensuring that each wash is identical in its cover is impossible. Different washes will have different concentrations of pigment, and different papers (and environmental conditions) will also affect the spread of the wash, hence the area covered. It is also difficult to measure such irregular areas accurately. I therefore decided that any method based on such a paint-out would be too erratic, and not give reproducible results. Instead, I chose to measure the change in mass of the brush, measured before and after painting out. The principle is simple: charge the brush fully and weigh it, then paint out until the resulting coverage becomes broken (i.e. the brush ‘dry’), and finally reweigh the brush. The difference between those two weights gives the mass of paint laid onto the paper. In separate tests I could estimate a conversion factor between mass of paint and area coverage, and use that single conversion factor for all tests. I next considered whether I should conduct my tests using paint, or water alone. The advantages of using paint are its ‘realism’, and to measure the painted area (which I was not going to attempt). 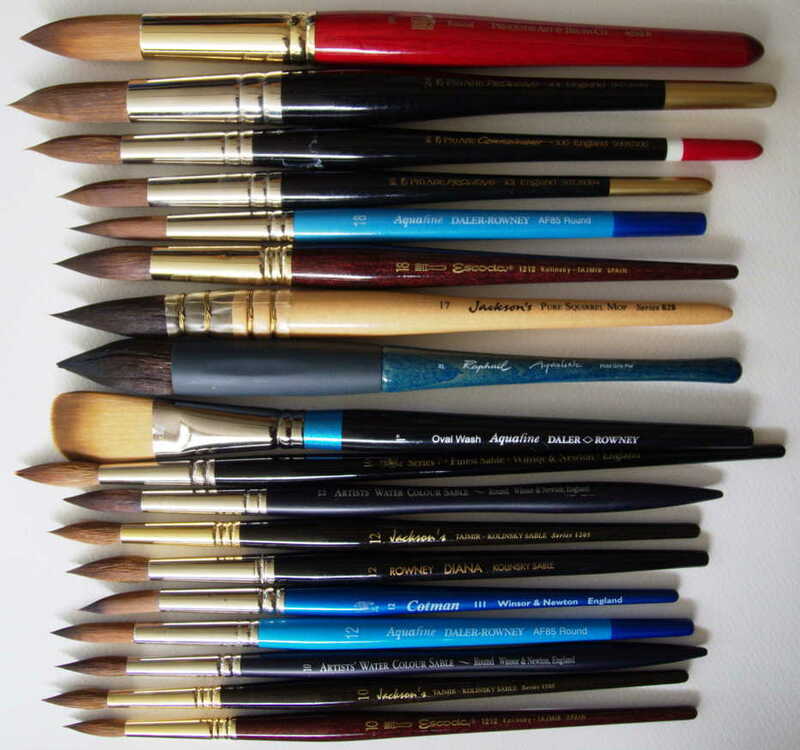 The disadvantages are that the paint concentration would have to be made constant, and that the brushes would have to be washed in a standard way before each test, to ensure that they started with the same amount of water or paint in the brush. It was clear that using water alone would give representative results which would be much more consistent and reliable. My next concerns were how reproducibly I could fully charge (wet) each brush to provide the starting, fully wet, mass. Pilot tests showed that, provided I followed the practice that I use in painting, I could get quite high reproducibility, although as you will see when I discuss my results, there are some exceptions to this. The other important issue was how reproducible would be the point at which I deemed the brush to be fully discharged. A little thought suggested that this would be a point along the flattening section of an exponential curve – in other words, the more water had been painted out of the brush, the less would come out in each further brushstroke. So the drier the brush had become, the less critical it was to stop at exactly the same point, as it was changing mass much more slowly. To assess this, I performed two tests, one with a synthetic brush, the other a sable, in which I re-weighed the brush after every 10 cm long stroke on the paper. 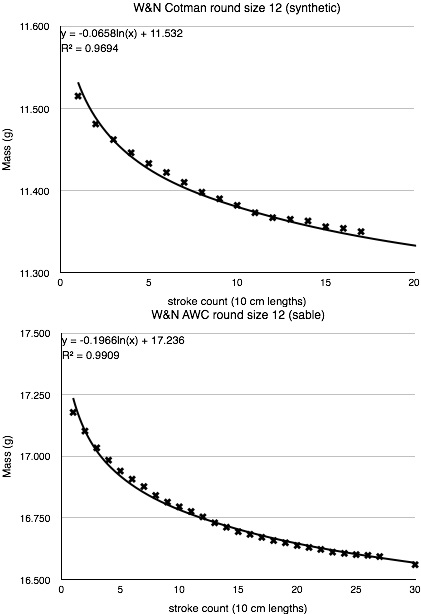 As I had expected, the measured weight changed in an exponential way, with the changes become smaller as less water remained in the brush, as shown in the graphs below. Discharge curves for a synthetic (above) and sable round size 12 brush, showing their exponential form. Equations and correlations are given for the fitted curves. The best way to visualise this effect is graphing the successive change in mass (the difference between consecutive masses) on a semi-logarithmic scale, as this should result in a straight line. It does, for both the sable and the synthetic. The point at which the second weighing takes place is towards the end of the series of points, where the change in mass with each stroke has become very low: for the synthetic brush, with changes of only around 0.002 g; for the sable, with changes of only around 0.005 g.
Semilog plots of the change in mass with each stroke on paper, for a synthetic (above) and sable round size 12 brush. These would regress well to straight lines. I therefore ran a series of pilot tests with a range of round brushes of different hair and manufacture, and the results appeared sufficiently reproducible. I decided that the best way to perform the tests was to make three consecutive measurements on each brush, and to take the middle result (median) as the most representative. Charging the brush, to bring it to a state of being fully charged, is filling it to its capacity with (tap) water, such that it holds as much water as possible, but does not drip. Discharging the brush brings it to a state in which it cannot lay down further continuous areas of wash, which are unbroken and have a smooth edge. At this point the drag of the brush increases noticeably, and the body of its fibres/hairs splits into uncontrollable clumps. It is then discharged, although it still contains some residual water. 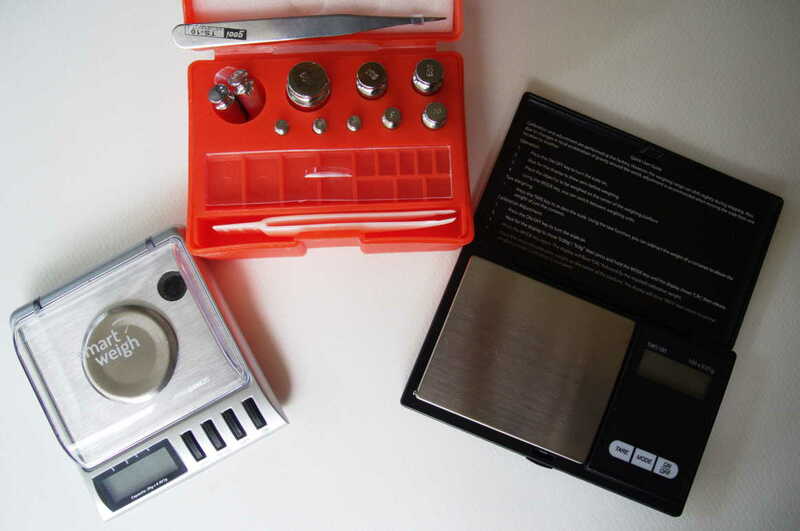 Key equipment required: two sets of electronic scales, with calibration/check weights behind. For brushes of size 12 and below, with a charged mass of less than 20 g, scales with a range of 0 to 20 g were used. These resolve to 0.001 g (1 mg). Electronic (load cell) scales; for my tests I used one model (Smart Weigh Digital Jewellery Scale GEM20, via Amazon UK) which reads to a maximum of 20 g with a resolution of 0.001 g (1 mg), for brushes whose charged mass is below 20 g, i.e. size 12 and smaller. Another model (Smart Weigh Digital Pocket Scale SWS100, via Amazon UK) which reads to a maximum of 100 g with a resolution of 0.01 g (10 mg) was used for all larger brushes. Manufacturer’s recommendations are followed for use, particularly achieving tare before weighing, and calibration using mass standards. Before each test session the scales were checked using a mass standard of half of their full scale, to ensure that this was within +/- one resolution unit of the standard. 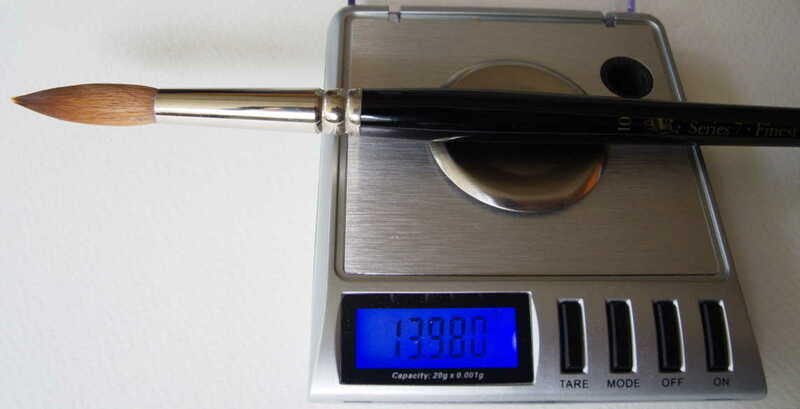 For brushes with a charged mass of more then 20 g, scales with a maximum capacity of 100 g were used. Tap water in a container of appropriate size, at ambient temperature (20˚C to 23˚C). A pad of NOT watercolour paper for painting brushes onto (Daler-Rowney Aquafine 300 gsm NOT). The total cost of the equipment used was approximately £60, less than half the cost of the most expensive brush tested, and a tiny fraction of the total cost of the brushes tested. Each brush is tested individually and completely before the next. New brushes are soaked, rinsed, and dried to remove any dressing before any testing takes place. Prior to testing the brush is dried in ambient air as completely as possible. The brush is first weighed completely dry. It is then immersed in water to a level 2 to 3 mm below the end of the ferrule and allowed to become fully charged with (tap) water. Normal painting procedures are followed to help the hairs disperse properly and encourage water uptake. Once fully wet, the brush is removed from the water and excess gently drained off, by touching the tip gently against the edge of the water container a small number of times. The aim is to carry as much water as possible in the fully charged brush, but for it not to drip during weighing, or before it is brought to the paper. The brush is then weighed fully charged. Once a stable mass has been recorded, it is brushed out on the paper as if laying down a wash. Strokes are maintained steadily until the discharged state is reached, as observed in the feel of the stroke, the laydown of water on paper, and the splitting of the body of the brush. The brush is then weighed again. Folowing that, the brush is immersed in water again, and the sequence repeated until three sets of fully charged and discharged masses have been obtained. This method yields three changes in mass, thus the weight of water laid down on the paper, rather than the area equivalence of a charge of paint. To estimate the area equivalence, three tests were performed using one brush with a medium strength black wash (W&N Artists Water Colour tube) on a sheet of the same paper. Washes were applied to form rectangles for ease of measurement. Once dry, the three areas were measured, and compared with the mass of wash (water plus paint) which had been laid down (the difference in weights). The median equivalence is taken, as cm^2 paper covered per gram of wash laid onto the paper. This was 471 cm^2 per g (range 436 to 510). Although this is an approximation, this constant is used throughout, thus does not affect comparisons between brushes. 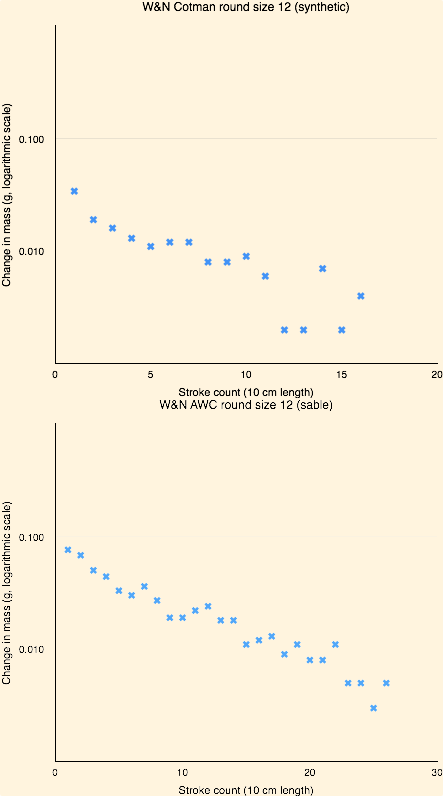 Final calculations are to convert the changes in mass measured in the tests to equivalent areas using that constant, and to express those equivalent areas relative to the current quoted cost (Jackson’s website) of each brush. Measurements of each brush were also made when the brush was dry. For each brush, the median equivalent area covered and the area covered per pound cost were recorded as results. 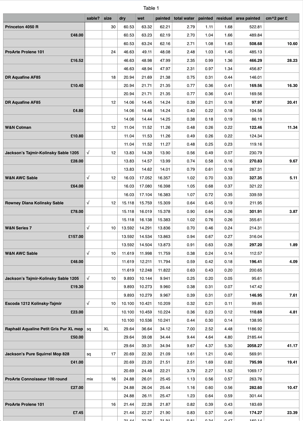 Results were calculated in a Numbers spreadsheet. The next article in this series will present and discuss results from a wide range of brushes from sizes 10 to 30, in a range of different fibres including synthetics, sables, and squirrels, mostly rounds but including two mops and an oval flat, over a price range of £4.80 to £157.